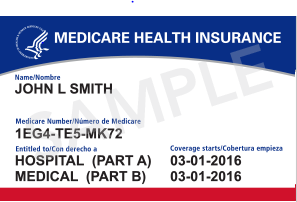 New Medicare Cards - In order to comply with new laws requiring the removal of Social Security Numbers from all Medicare cards by 2019, Medicare will soon be updating all Medicare cards (both old and new). Under the new system, for each person enrolled in Medicare a new Medicare Beneficiary Identifier (MBI) card will be issued. This new card will replace your current Medicare Card and will no longer use your Social Security Number. Medicare is making this change to prevent fraud, fight medical identify theft, and keep taxpayer dollars safe. ​How Will the MBI Look - You new Medicare card will look very different than your current Medicare card. The new card will be 11-characters in length and will be made up of numbers and uppercase letters. ​Timeline - Beginning in April 2018 Medicare will start mailing new Medicare cards to all people with Medicare. ​Transition Period - Medicare plans to have a transition period where you can use either your current Medicare card or your new card. The transition period will end on January 1, 2020 when you will be required to use your new card.